*Including income. As at 14 November 2018. *As at 30 September 2018. Fidelity China Special Situations (FCSS) aims to provide an attractive way for investors to gain exposure to the faster-growing areas of the Chinese economy, with China’s growing economic influence raising its importance within a balanced portfolio. FCSS’s longer-term performance has been strong – its NAV total return is ahead of the MSCI China index over five years and since its launch in 2010 – but returns are negative over one year, reflecting the Chinese stock market downturn. While market sentiment has suffered due to the US-China trade dispute, earnings forecasts have been largely unaffected, and the manager has used the correction to add to holdings with strong long-term prospects at historically low valuations. FCSS holds a diversified Chinese equity portfolio, unrestricted by index weightings. The manager looks for companies with robust cash flows and strong management in structurally faster-growing areas of the economy. He has a bias to small/mid-cap stocks, which tend to be under-researched and often provide better opportunities. Detailed research is conducted on all holdings by Fidelity’s extensive analyst team. Site visits and company meetings are an essential part of the investment process, with risk management a priority. Contracts for difference (CFDs) are used to add gearing, as well as to take short positions and to hedge market exposure, alongside futures and options. 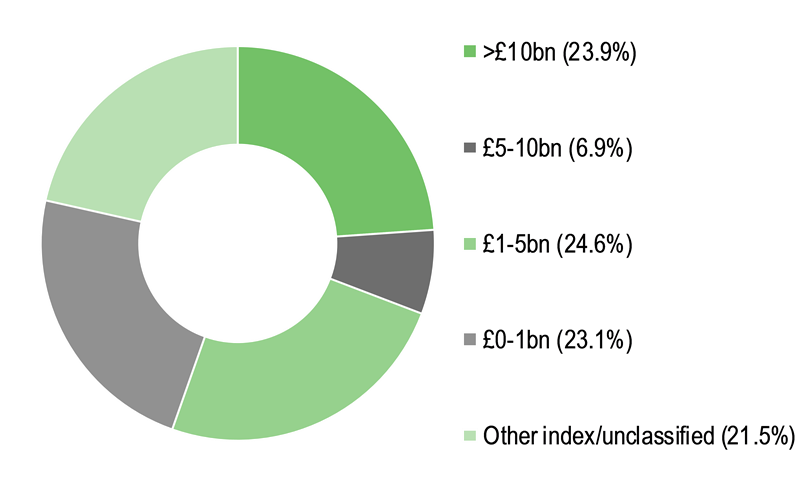 Unlisted securities are permitted up to 10% of the portfolio. Despite the ongoing US-China trade dispute, China’s economic growth outlook and corporate earnings forecasts have remained strong. However, the recent market correction has reduced valuation multiples to historically low levels for many stocks with attractive longer-term prospects, and the Chinese market forward P/E multiple appears low relative to other markets, particularly given China’s superior medium-term growth prospects. Market volatility could remain elevated in the near term, but longer-term investors wishing to add exposure to China may be attracted by current valuation levels. Another consideration is the rising inclusion of Chinese equities in global stock market indices, which should support medium-term investment inflows. FCSS’s share price discount to NAV including income has been relatively stable within a 10% to 15% range since October 2016. 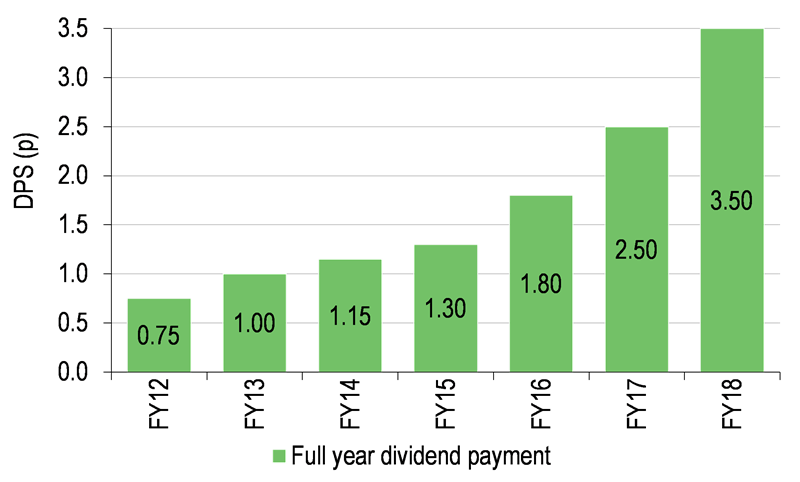 FCSS’s current 11.2% discount is narrower than its one-, three- and five-year averages (12.3%, 14.1%, 13.3%) and lower than average in its sector, while its 1.8% dividend yield is above average. 12 June 2018: Full-year results to 31 March 2018 – NAV TR +22.2% versus benchmark TR +23.8%; share price TR +23.6%. 12 June 2018: 3.50p dividend recommended for FY18 versus 2.50p for FY17. Source: Fidelity China Special Situations, Edison Investment Research, Bloomberg, Morningstar. Note: *Gearing net of short positions. **N/A where not in September 2017 top 10. 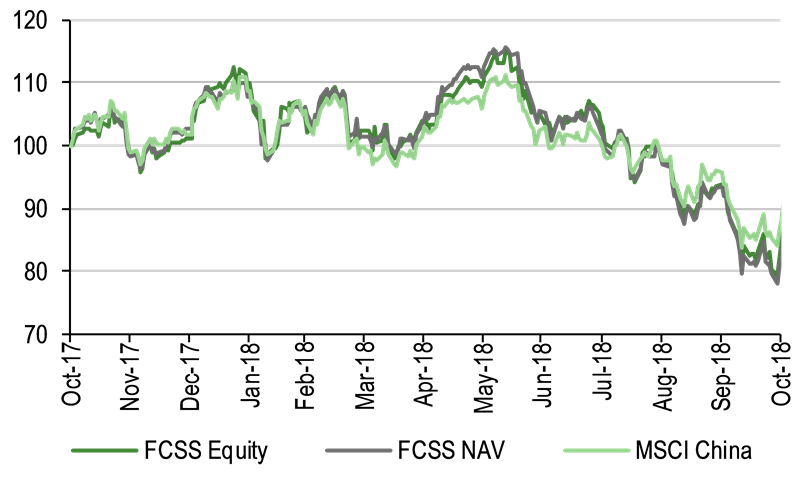 The 2018 Chinese stock market correction has seen the MSCI China index unwind all of its substantial 2017 outperformance of the MSCI World index, with the two indices delivering broadly similar three-year returns, significantly ahead of the FTSE All-Share index (see Exhibit 2 chart). As well as the effect of the recent market fall, Chinese equity forward P/E multiples have declined due to strong underlying corporate earnings growth. At end-October 2018, the Chinese market forward P/E multiple was at a slightly lower level than emerging markets overall, and at a c 31% discount to developed markets (see Exhibit 2 table). This contrasts with China’s superior growth prospects, reflected by the IMF’s latest forecasts for 6.1% annualised Chinese GDP growth from 2018 to 2023, compared with 3.8% for other emerging market economies and 1.8% for advanced economies. Source: Thomson Datastream, Edison Investment Research, MSCI. Note: Valuation data as at end-October 2018. China’s relatively strong projected economic growth provides a favourable backdrop for medium-term corporate earnings growth, which supports a positive market outlook. The current Chinese market forward P/E multiple appears relatively attractive in comparison with world markets, suggesting scope for re-rating to push the market higher, in addition to strong earnings growth. While market volatility may remain elevated in the near term, given the ongoing trade dispute with the US, investors with a longer-term horizon may find appeal in gaining exposure to China’s long-term growth prospects at current valuation levels. A further consideration is the gradual inclusion of Chinese equities in global stock market indices, which should support future investment inflows. FCSS aims to generate long-term capital growth by investing in a selected portfolio of Chinese equities, primarily comprising companies listed in China or Hong Kong and Chinese companies listed on other recognised exchanges. FCSS’s performance benchmark is the MSCI China index (sterling adjusted), but sector exposures are not constrained by index weightings. Stock selection is based on bottom-up analysis, resulting in a bias to areas of the economy with stronger structural growth prospects, and the portfolio also has a bias to small/mid-cap companies. The portfolio typically comprises 130-140 stocks, including unlisted investments. Gearing is permitted up to 30% of net assets, with CFDs used as a cheaper alternative to bank borrowings. CFDs are also used to take short positions on individual stocks as well as to hedge market exposure. FCSS’s investment manager is Fidelity International, with Dale Nicholls having acted as portfolio manager since April 2014. Based in Hong Kong, Nicholls has 15 years’ experience investing in China. He is supported by Fidelity’s extensive team of research analysts, which covers c 600 stocks in the Greater China investment universe. The current US-China trade dispute has clearly affected market sentiment, but Nicholls’ view is that China’s economic outlook has been largely unaffected and corporate earnings prospects remain strong. He notes that US-China trade (exports and imports) represents c 4.8% of China’s GDP and c 14% of China’s total trade, and accounts for c 3.0% of US GDP and c 16% of total US trade, so a full-blown trade war could have a materially adverse effect on the US as well as China. Nicholls emphasises that FCSS is focused on China’s domestic economy, so the risk to portfolio companies’ earnings is more limited than for export businesses. He is reassured by China’s focus on controlling credit growth, but still avoids bank stocks, as he expects non-performing loan levels to rise further. Nicholls points out that earnings forecasts have remained strong during the recent market sell-off, making P/E valuation multiples compelling versus other markets and relative to earnings growth forecasts of 20-25% for 2018. Nicholls notes that small-cap underperformance has contributed to FCSS’s recent relative weakness, while other factors include materials sector strength – which has provided additional shorting opportunities for FCSS – and the sell-off in insurance stocks such as China Pacific Insurance – where he took the opportunity to add to FCSS’s position at a historically low valuation. Nicholls also took advantage of the market sell-off to add positions in other stocks with strong longer-term prospects, also trading at historically low valuations. These included market leading surveillance companies Hikvision and Zhejiang Dahua; pharmaceutical distributor Shanghai Pharmaceuticals, which had lagged the broader sector due to disruption from regulatory changes; and securities brokers, CITIC Securities and CICC, which both have strong institutional businesses. Nicholls highlights that FCSS’s unlisted holdings have made a positive contribution to performance, with Aurora Mobile (Jiguang) completing its US IPO at the end of July and Meituan Dianping (China Internet Plus Holdings) coming to market in mid-September. FCSS has recently added two new unlisted holdings, which the manager believes to have very strong growth prospects: SenseTime – an artificial intelligence technology company, and an unnamed leading drone manufacturer. FCSS follows a bottom-up approach to stock selection, with no restrictions on sector allocations. The manager seeks to invest in highly cash-generative companies run by capable management teams, focusing on industries with above-average structural growth prospects in the Chinese economy. The portfolio manager is supported by Fidelity’s team of 23 analysts researching Chinese equities (based in Hong Kong, Singapore and Shanghai) who conduct detailed company analysis. Company meetings are a key element in assessing prospective investments as well as monitoring existing holdings. The portfolio has a bias to small- and mid-cap stocks, where the manager finds more companies with market valuations that do not reflect their long-term growth prospects. Investing in small-cap stocks can carry higher risks, making risk management an important part of the process. The same overall approach is applied to investments in listed and unlisted companies. Bank borrowings and CFDs are used to add gearing, with CFDs also used to take short positions on individual stocks and to hedge market exposure, along with index futures and options. Borrowing is permitted up to 25% of net assets, with total gearing from borrowings and derivatives restricted to 30% of net assets. Individual holdings are limited to 15% of the portfolio at the time of acquisition, while a 10% limit applies to the total value of unlisted investments, and total short exposure is restricted to 15% of gross assets. China ‘A’ shares are purchased using Fidelity’s Qualified Foreign Institutional Investor (QFII) licence, as well as via brokers who hold a QFII. 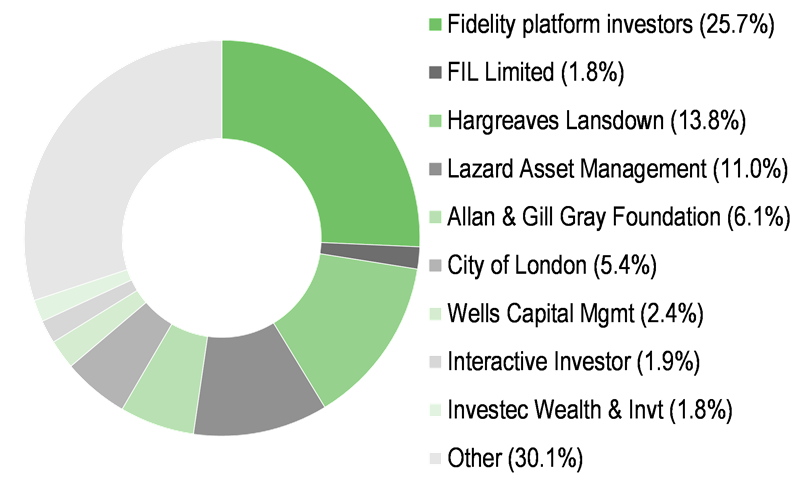 FCSS’s portfolio comprises 130-140 holdings but is relatively concentrated in the top 10 positions, which accounted for 39.9% of the portfolio at end-September 2018 (see Exhibit 1). Tencent and Alibaba accounted for 21.5% of the portfolio, which represents a significant underweight position relative to their 26.6% combined weight in the benchmark index. At the end of September 2018, changes were made to the Global Industry Classification Standard (GICS) sector definitions, mainly affecting the categorisation of media, entertainment, internet and e-commerce stocks. Among other changes, Tencent and Alibaba were reclassified from information technology to communication services and consumer discretionary, respectively, which accounts for a large part of the changes in FCSS’s sector exposure shown in Exhibit 3. FCSS’s portfolio continues to be broadly diversified across all 11 market sectors, but with highly differentiated exposures compared to the benchmark index. The sector weightings are the result of the bottom-up stock selection process and the manager’s focus on faster-growing areas of the Chinese economy – primarily driven by rising domestic consumption and ongoing structural reforms. Following the sector reclassifications, information technology and consumer discretionary are the portfolio’s most significant overweights, with financials and communication services the largest underweights. FCSS does not hold any bank stocks, and its largest underweight stock position is China Construction Bank, which represents 5.2% of the index. As shown in Exhibit 4, FCSS’s recent performance largely reflects the Chinese market sell-off, with the MSCI China index falling 25% in sterling terms from mid-June to mid-October 2018. FCSS underperformed the index during this market decline, as would be expected given its c 20% net market gearing, which makes it more likely to underperform during a broad market correction, as well as outperform a broad market rally. 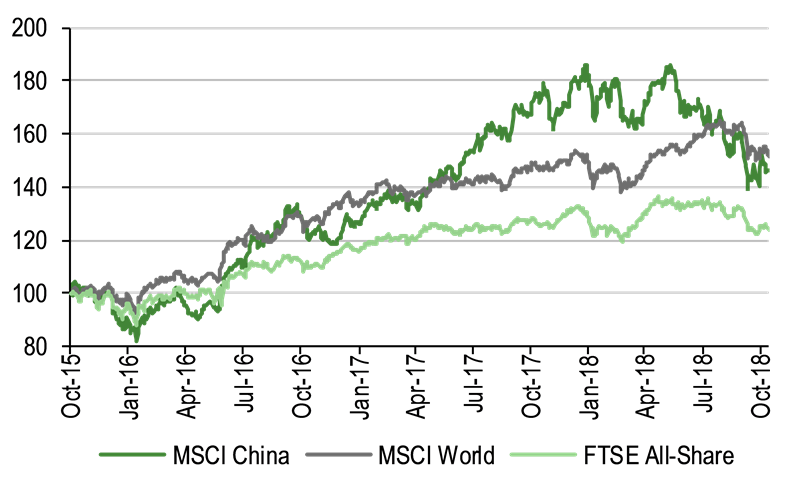 In spite of this recent weakness, FCSS’s longer-term share price and NAV total returns have been reasonably strong in absolute terms and have outperformed the MSCI China index benchmark over five years to end-October 2018 and since its inception in 2010. From its inception to end-October 2018, which includes another pronounced period of weaker NAV performance (-32.1%) in 2011, FCSS has achieved a 10.3% pa NAV total return, clearly ahead of the MSCI China index’s 6.1% pa return. Source: Thomson Datastream, Edison Investment Research. Note: Data to end-October 2018. Inception date is 16 April 2010. Geometric calculation. 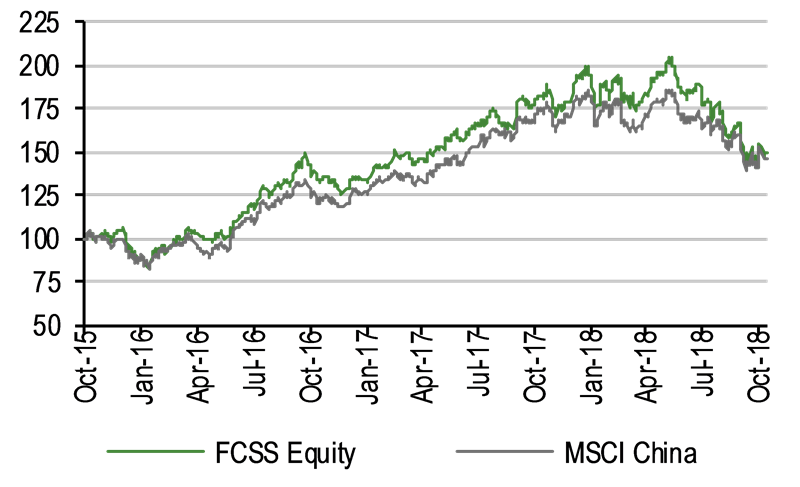 Despite its significant underperformance over one year – largely reflecting the underperformance of Chinese equities relative to world markets over this period, FCSS’s NAV total return is ahead of both the MSCI World and FTSE All-Share index returns over five years, as shown in Exhibit 5. 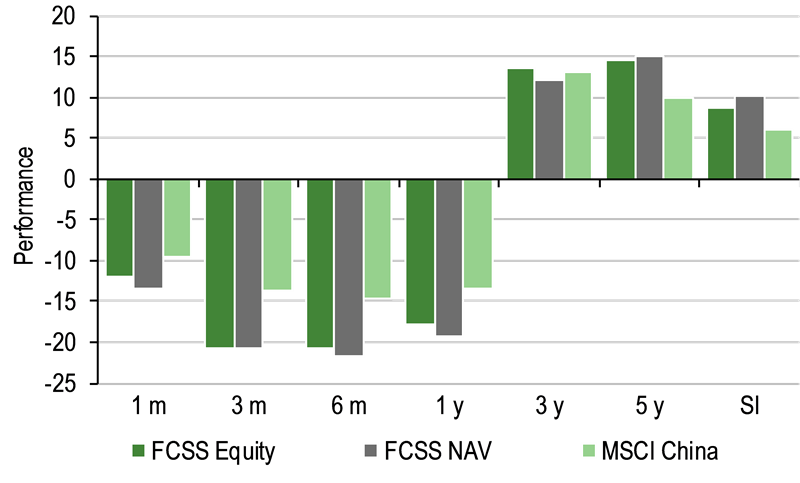 FCSS has also outperformed the FTSE All-Share index over three years and since the trust’s inception. 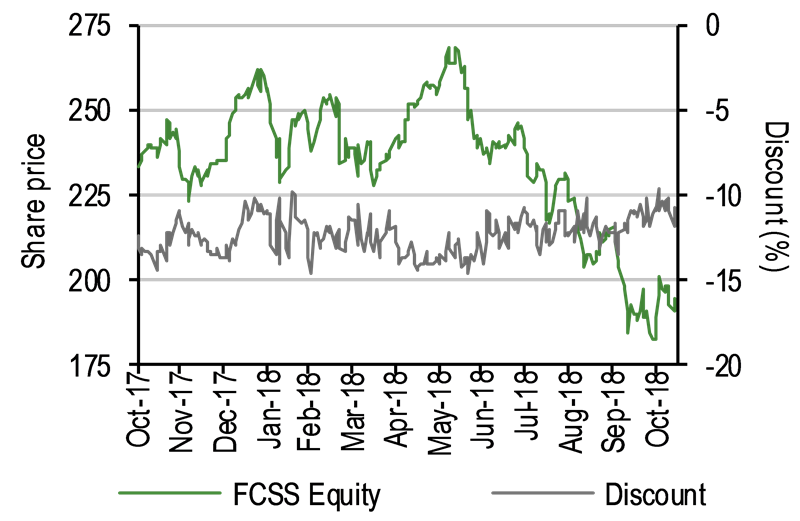 Exhibit 6 shows FCSS’s considerable outperformance of its benchmark over five years, providing a longer-term context for its weaker relative performance since May 2016. As shown in Exhibit 7, FCSS’s share price discount to NAV including income has broadly moved within a 10% to 15% range since October 2016, having narrowed from c 20% in early 2016 when the MSCI China index reached a three-year low, down c 40% (in sterling terms) from its 2015 high. FCSS’s current 11.2% discount is narrower than its 12.3% one-year average and its 14.1% and 13.3% averages over three and five years respectively. Since its launch in 2010, FCSS’s shares have traded between a 13.2% premium and a 23.4% discount to NAV, strongly influenced by changes in sentiment towards Chinese equities. FCSS has 549.9m ordinary shares in issue, with a further 21.5m shares held in treasury, following the repurchase of 1.6m shares since May 2018, after a six-month pause. FCSS has authority to buy back up 14.99% of its issued shares at a discount to NAV and allot up to 10% of issued capital at a premium to NAV. There is no strict discount control mechanism, and buybacks have been modest in recent years (see Exhibit 1). FCSS has a fully-drawn US$150m credit facility, paying interest at a fixed 3.01% pa and maturing in February 2020, which equates to c 8% gearing. Additional gearing is achieved at low cost through long CFDs on a number of portfolio holdings. 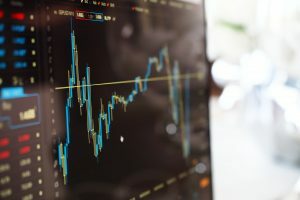 CFDs are also used to take short positions on individual stocks, as well as to provide a market hedge alongside index futures and options positions. Gross gearing is permitted up to 30% of net assets and FCSS had 27.1% gross gearing, with net gearing of 18.5% (net of short positions), at end-September 2018. A new variable management fee was introduced on 1 July 2018, with FCSS paying a 0.90% pa fee on net assets with a ±0.20% variation fee, based on NAV performance relative to the benchmark index. This takes the range of potential fees payable down to 0.7-1.1% pa, from 1.0-2.0% pa under the previous fee structure. The annual administration fee paid to the manager was also reduced from £0.6m to £0.1m on 1 April 2018. Since April 2017, management fees and finance costs have been allocated 75% to capital and 25% to revenue (previously 50:50 allocation), to reflect historical capital and revenue contributions to total returns. The reported FY18 ongoing charge was 1.35% of net assets, which includes interest charges (0.24pp), while the underlying 1.11% ongoing charge was slightly lower than the 1.16% reported figure for FY17, calculated on an equivalent basis. While FCSS has a capital growth objective, as an investment trust it distributes at least 85% of its revenue earnings and an annual dividend is paid in July/August each year. The dividend has been increased every year since FCSS’s inception (see Exhibit 1), compounding at c 28% pa over the last five years. A 3.50p dividend was paid for FY18, representing a 40.0% increase on FY17, with a change in the allocation of management fees and finance costs increasing the amount available for distribution, compared with the prior year. The 3.50p dividend was 1.09x covered by revenue earnings and equates to a 1.8% dividend yield, based on the current share price. No commitment has been made in relation to growing or maintaining the dividend, and the annual payout will vary according to portfolio income generation. However, FCSS has revenue reserves equating to 2.06p per share, which could be used to smooth future dividend distributions. 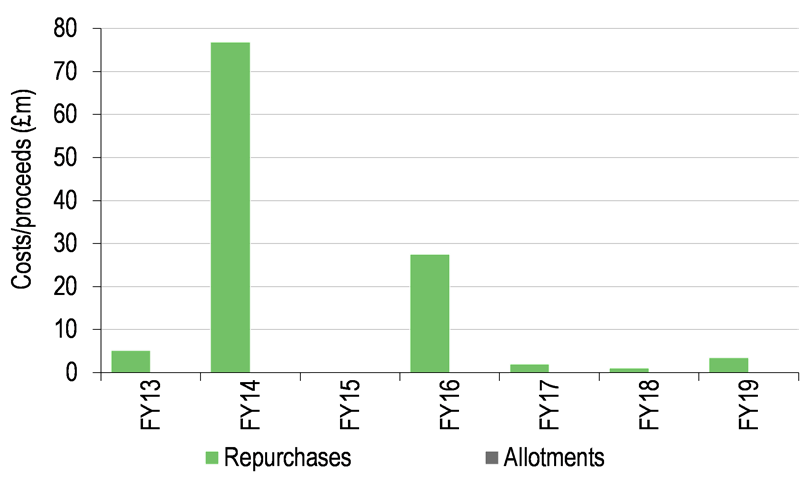 Exhibit 8 shows a comparison of FCSS with other open- and closed-ended funds that invest primarily in Chinese equities. Within the AIC Country Specialists: Asia Pacific sector, JPMorgan Chinese is the only other fund focused on China, so we show averages for the AIC Asia Pacific ex-Japan sector, which is more relevant due to its 39% aggregate exposure to China & Greater China. IA China/Greater China open-ended funds larger than £300m with more than five years’ track record are also included. FCSS’s NAV total return is the highest of all funds shown over five years, with performance modestly ahead of JPMorgan Chinese over one and three years. FCSS’s NAV total return has underperformed both the AIC Asia Pacific ex-Japan sector average and the IA China/Greater China peer group average over one and three years, which is not unexpected given the recent Chinese market correction and FCSS’s relatively high level of gearing. FCSS’s ongoing charge is higher than the AIC Asia Pacific ex-Japan sector average, but is one of the lowest among its open- and closed-ended single-country fund peers. FCSS has the highest gearing among its closed-ended peers, although this includes short positions and its net market gearing is below 20%. FCSS’s discount is slightly narrower than the 12.1% average across the AIC Country Specialists: Asia Pacific sector, and its dividend yield is above average among single-country fund peers. Source: Morningstar, Edison Investment Research. Note: *Performance data to 13 November 2018. **Excluding interest on bank loans and overdrafts (0.24pp). TR = total return. Net gearing is total assets less cash and equivalents as a percentage of net assets (100 = ungeared). At the July 2018 AGM, non-independent director John Ford stepped down from the board and FCSS announced the appointment of Mike Balfour as a director with effect from 1 October 2018. Subsequently, Vera Hong Wei (appointed March 2016) has resigned from board, effective 31 October 2018. Following these changes, FCSS’s board comprises five independent non-executive directors. Balfour has over 30 years’ financial services experience; he was CEO of Thomas Miller Investment until 2016 and was previously CEO at Glasgow Investment Managers and CIO at Edinburgh Fund Managers. He is a director of Standard Life Investment Property Income Trust, Martin Currie Global Portfolio Trust and Perpetual Income and Growth Investment Trust. The other board members are chairman Nicholas Bull (appointed director February 2010, chairman July 2016), senior independent director Elisabeth Scott (appointed November 2011), David Causer (appointed February 2010) and Peter Pleydell-Bouverie (appointed February 2010). David Causer will step down from the board at the conclusion of the 2019 AGM, when he will have completed his nine-year term. Copyright 2018 Edison Investment Research Limited. All rights reserved. This report has been commissioned by Fidelity China Special Situations and prepared and issued by Edison for publication globally. All information used in the publication of this report has been compiled from publicly available sources that are believed to be reliable; however we do not guarantee the accuracy or completeness of this report. Opinions contained in this report represent those of the research department of Edison at the time of publication. The securities described in the Investment Research may not be eligible for sale in all jurisdictions or to certain categories of investors. This research is issued in Australia by Edison Investment Research Pty Ltd (Corporate Authorised Representative (1252501) of Myonlineadvisers Pty Ltd (AFSL: 427484)) and any access to it, is intended only for "wholesale clients" within the meaning of the Corporations Act 2001 of Australia. The Investment Research is distributed in the United States by Edison US to major US institutional investors only. Edison US is registered as an investment adviser with the Securities and Exchange Commission. Edison US relies upon the "publishers' exclusion" from the definition of investment adviser under Section 202(a)(11) of the Investment Advisers Act of 1940 and corresponding state securities laws. As such, Edison does not offer or provide personalised advice. We publish information about companies in which we believe our readers may be interested and this information reflects our sincere opinions. The information that we provide or that is derived from our website is not intended to be, and should not be construed in any manner whatsoever as, personalised advice. Also, our website and the information provided by us should not be construed by any subscriber or prospective subscriber as Edison’s solicitation to effect, or attempt to effect, any transaction in a security. The research in this document is intended for New Zealand resident professional financial advisers or brokers (for use in their roles as financial advisers or brokers) and habitual investors who are “wholesale clients” for the purpose of the Financial Advisers Act 2008 (FAA) (as described in sections 5(c) (1)(a), (b) and (c) of the FAA). This is not a solicitation or inducement to buy, sell, subscribe, or underwrite any securities mentioned or in the topic of this document. This document is provided for information purposes only and should not be construed as an offer or solicitation for investment in any securities mentioned or in the topic of this document. A marketing communication under FCA rules, this document has not been prepared in accordance with the legal requirements designed to promote the independence of investment research and is not subject to any prohibition on dealing ahead of the dissemination of investment research. Edison has a restrictive policy relating to personal dealing. Edison Group does not conduct any investment business and, accordingly, does not itself hold any positions in the securities mentioned in this report. However, the respective directors, officers, employees and contractors of Edison may have a position in any or related securities mentioned in this report. Edison or its affiliates may perform services or solicit business from any of the companies mentioned in this report. The value of securities mentioned in this report can fall as well as rise and are subject to large and sudden swings. In addition it may be difficult or not possible to buy, sell or obtain accurate information about the value of securities mentioned in this report. Past performance is not necessarily a guide to future performance. Forward-looking information or statements in this report contain information that is based on assumptions, forecasts of future results, estimates of amounts not yet determinable, and therefore involve known and unknown risks, uncertainties and other factors which may cause the actual results, performance or achievements of their subject matter to be materially different from current expectations. For the purpose of the FAA, the content of this report is of a general nature, is intended as a source of general information only and is not intended to constitute a recommendation or opinion in relation to acquiring or disposing (including refraining from acquiring or disposing) of securities. The distribution of this document is not a “personalised service” and, to the extent that it contains any financial advice, is intended only as a “class service” provided by Edison within the meaning of the FAA (ie without taking into account the particular financial situation or goals of any person). As such, it should not be relied upon in making an investment decision. To the maximum extent permitted by law, Edison, its affiliates and contractors, and their respective directors, officers and employees will not be liable for any loss or damage arising as a result of reliance being placed on any of the information contained in this report and do not guarantee the returns on investments in the products discussed in this publication. FTSE International Limited (“FTSE”) © FTSE 2018. “FTSE®” is a trade mark of the London Stock Exchange Group companies and is used by FTSE International Limited under license. All rights in the FTSE indices and/or FTSE ratings vest in FTSE and/or its licensors. Neither FTSE nor its licensors accept any liability for any errors or omissions in the FTSE indices and/or FTSE ratings or underlying data. No further distribution of FTSE Data is permitted without FTSE’s express written consent.